You would have noticed that now a days, most of the websites ask you whether “You would like to subscribe for push notifications from this website?”. For those who dont know – It is called web push notification. What is a web push notification ? Web push notification is similar to push notifications from mobile apps. But for receiving web push, your users don’t have to install any apps on their desktop / mobile phone. They just have to subscribe to notifications from your website. And the notification is directly delivered to their device, even if they have closed your website. Which is a good web push notification service for my website ? Here, I am introducing a service named Engagespot (Which I’m using on my blog Vyutech.com). 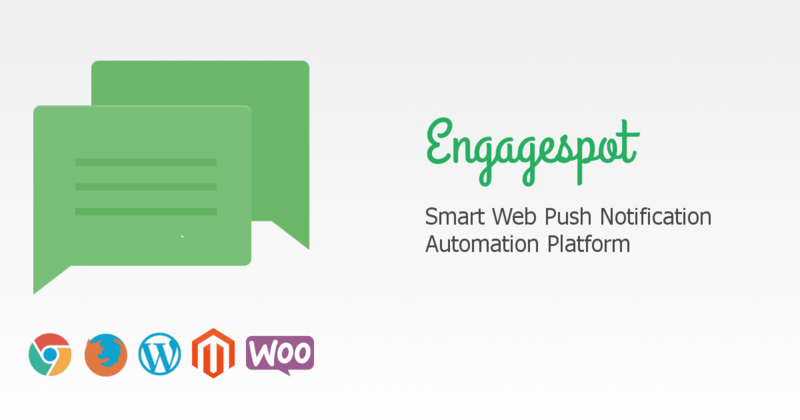 Engagespot is a push notification automation platform for websites to send targeted web push notifications to desktop and mobile devices based on customer behaviour. It segments users based on their behaviour on a website, such as page visits, cart abandonment, purchase history etc and send highly personalised push notifications directly to their desktop or mobile devices. The notifications will be delivered even if the customer has closed your website. One of the promising feature of Engagespot is its Intelligent Automation module, where you can define rules to trigger push notifications based on user’s behaviour or profile data. For example, you can define a rule to send notification to a customer who added a product to cart, but haven’t purchased after 2 days. Engagespot can be easily integrated to WooCommerce websites using our plugin. How to install it on my blog ? For wordpress users, Engagespot provides a free plugin. Just install the plugin and follow their simple configuration instructions to add web push notification to your blog. Yes, Engagespot have a free plan for bloggers and small websites. You can sign up for their free plan for your blog.